On a day when everyone’s singing ‘Silent Night’, it’s probably best to take heed and watch a silent movie, although the laughs that are assured with a viewing of Steamboat Bill Jr. just might break that cone of silence. 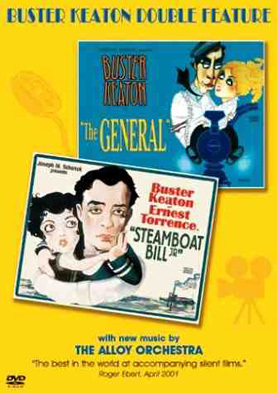 It’s full of all the slapstick humour and crazy sight gags that were Buster Keaton’s trademark. Great Stone-Face, they called him, remaining deadpan as the world literally crumbles around him, and in this film, that world is a little town called River Junction. Steamboat Bill (Ernest Torrence) runs a dilapidated operation on the Mississippi and when his long lost son comes to visit he puts him to work on it but Junior (Keaton) only has eyes for Miss Kitty (Marion Byron), the daughter of a rival steamboat owner. Junior’s task is to prove himself worthy of her and the sudden onslaught of a ferocious cyclone provides the perfect opportunity to do so. In what was, for the time, a massive special effects undertaking, the town is torn asunder by the force of six aircraft engines. For twelve whole minutes Keaton is buffeted from one building to the next as each one collapses around him. Perhaps because he was such a role model for characters like Mickey Mouse (whose first sound cartoon was based on this film), it’s easy to take his stunts for granted but they involved a huge risk. One in particular sees Keaton dusting himself off in front of a building when the whole facade falls on top of him. Fortunately, he is standing in the exact spot of an open window but two inches either way would’ve seen him seriously injured. This is a guy who grew up being thrown around various vaudeville stages by his parents for laughs so he knew what it took to get one and went the distance every time. Steamboat Bill Jr. may have been one of Keaton’s biggest box office disasters and lead him even further to drink but it did pave the way for many popular children’s films and still tickles the funny bone today. So a caution to any one intent on a truly silent night; you may be able to turn down the authentic organ musical accompaniment but the laughter’s another matter.